Europe is in the midst of a major demographic crisis, with many countries facing ultra-low fertility rates. This column uses survey data from 19 European countries to show how low fertility can be traced to disagreement within couples about having babies. In low-fertility countries, it is usually the women who bear most of the burden of childbearing, and who veto having more babies. Fertility can be raised by policies that specifically lower cost to women of childcare, whereas general subsidies for childbearing are much less effective. The low levels of fertility in Europe are even more surprising considering that national governments are already doing a lot to push people towards having children. Unlike the US, most Western European countries offer generous parental leave, there are often substantial tax credits or direct subsidies for having children (such as Kindergeld in Germany), and schooling is usually publicly provided and free. But whereas in some cases (such as Belgium, France and the Scandinavian countries) policies had the desired effect and moved fertility back to (or close to) the level required for maintaining the population (see Figure 1), in other countries birth rates have refused to budge. Why do fertility rates stay low even while governments heavily subsidise childbearing? In new research, we argue that fertility rates depend not just on the total cost of raising children, but also on the distribution of these costs between mothers and fathers (Doepke and Kindermann 2016). Biology dictates that it takes both a woman and a man to make a baby. Hence, babies should arrive only if both potential parents believe that having a child is in their best interest and therefore they agree on the plan to have one. If the distribution of childcare is lopsided in the sense that one parent would have to do most of the work, this parent might object to the plan of having a child, so the couple disagrees. As a consequence, the fertility rate may remain low even if having children is subsidized. There are many couples who disagree on having babies, and babies are likely to arrive only if the parents agree. In the low-fertility countries in Europe, men contribute little to the burden of childcare, and hence women are stuck doing most of the work. Where women do most of the childcare work, they are also likely to veto having another child. In contrast, in the countries with high fertility rates men do more childcare work, and agreement and disagreement with having more children is balanced between the sexes. While our findings line up with some of the conventional wisdom on European fertility, until recently no suitable data was available to directly test the extent to which disagreement between women and men is responsible for low fertility. Our empirical results are based on the Generations and Gender Programme, a new longitudinal survey covering 19 mostly European countries. This dataset provides previously unavailable information on agreement versus disagreement on childbearing within couples. Specifically, respondents are asked whether each partner would like to have “a/another baby now”. Thus, we observe agreement or disagreement on having a first/next child for each couple. The data show that there is a lot of disagreement within couples over having babies, and that the nature of the disagreement varies systematically across high- and low-fertility countries. For the following graphs, we only look at couples in which at least one of the partners desires to have another child. Let ‘Disagree Male’ be the fraction of these couples where the woman desires a baby, but the man does not, and ‘Disagree Female’ be the fraction with the opposite situation of the man wishing for a baby and the woman disagreeing. 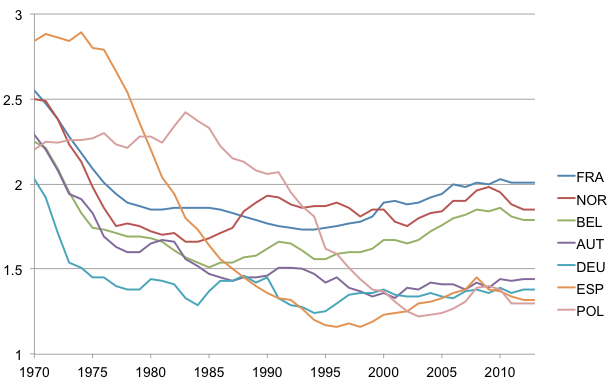 Figure 2 displays the relationship between these shares across countries, where each country’s fertility rate is noted in parentheses. The “red” countries (France, Belgium, Norway) are the countries in the data set with a fertility rate close to replacement, whereas the “blue” countries are low-fertility countries with a fertility rate of less than 1.5. In the figure, if all couples in a country were in agreement on fertility (either both want one or both do not), we would get a point at the origin. We find, to the contrary, that there is a lot of disagreement, even in the “red” high-fertility countries. In addition, there is a striking difference between red and blue in terms of who disagrees: In the low-fertility countries, many more women are opposed to having another child. In Figure 2, all the blue countries are below the 45-degree line, indicating a surplus of female disagreement with having more children, while the red countries lie on the 45-degree line, suggesting balance between male and female disagreement. In Russia, for example, out of 100 couples that already have one child and where at least one spouse desires another baby, there are 30 where the man desires a child but the woman does not, and only 10 with the opposite pattern of the woman wishing to have the baby with the man disagreeing. These numbers are even more dramatic (50 versus 20) when the couple already has two or more children. Using the same dataset, we can also show that disagreement has consequences. The couples who answer the question on whether they would like to have a baby are interviewed again three years later, so that we know which couples end up with a baby. The bottom line is that unless the couple agrees, a baby is unlikely to arrive. If the woman wants to have a baby and the man disagrees, there is still some chance to end up with a baby, but the likelihood is only about one-third compared to when the couple agrees. If it is the man who wants the baby and the woman disagrees, the impact on the probability of having a child (compared to couples who both don’t want a child) is indistinguishable from zero. Hence, men are unable to realize their wish for a baby against their partner’s wishes, and even though some women get what they want on their own, the only way to have a high probability of getting a baby is for both woman and man to agree on the plan. To assess how the efficacy of government policies aimed at increasing fertility depends on the patterns of agreement and disagreement over having babies in the data, we develop a bargaining model of fertility choices. Perhaps surprisingly, the economic literature on fertility choice has for the most part abstracted from the possibility of disagreement over having babies between potential parents. 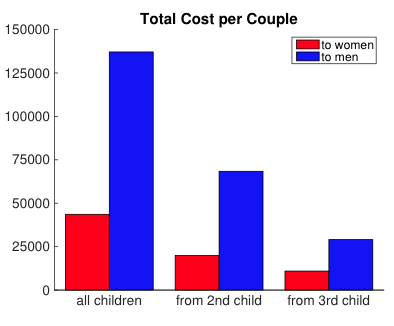 Instead, most existing models posit that couples aim to maximize a form of joint welfare, without regard to how the costs and benefits of having children are shared between the parents.2 Instead, we consider a model in which women and men each have their own preferences over childbearing, and disagreements can arise. We argue that disagreement is a consequence of an uneven distribution of the burden of childcare, coupled with a limited ability of spouses to make binding commitments.3 For example, if the woman anticipates that she would have to do most of the childrearing work, she will realise that this would impede her ability to pursue an independent career. As a consequence, if she had the child, her outside options would worsen and she would lose bargaining power within the marriage. The end result is that she may disagree with having a/another baby, even if the man would like to have one. Our conjecture that a lopsided distribution of the burden of childcare generates disagreement can be directly tested in the data. The dataset includes a number of questions about who in the household does various tasks involving children, such as getting them dressed, putting them to bed, or helping with homework. From these data, we construct an indicator of the average share of men in caring for children in each country. In all countries, men do less than half of the childcare work. However, in the high-fertility countries Belgium, France and Norway the male share is relatively high at 30-40%, whereas in the low-fertility countries men’s contribution is as low as 22%. Figure 3 plots men’s share in caring for children against the difference between Disagree Female and Disagree Male. The figure shows that in the countries where men do the least amount of childcare work, women are especially likely to disagree with their man’s wish for a child. Our results suggest that to solve the European fertility crisis, policy will have to address the fact that it is predominantly women who are opposed to having more children in low-fertility countries. Fertility is low in large part because women continue to bear the majority of the burden of childcare, and as long as this is the case, general subsidies for childbearing are unlikely to be effective. To illustrate this point, we use our bargaining model of fertility choice to compare the cost of alternative policies aimed at increasing fertility. One policy specifically aims to lower women’s burden of childcare (say, by providing public day care to substitute for childcare time usually provided by mothers), whereas the other consists of a lump sum subsidy provided to the father. We also distinguish policies that lower the cost for all children, and policies that target only higher-order children (i.e. that are paid only from the second or third child onwards). Figure 4 displays the total cost per couple of raising the fertility rate of a country by 0.1 for these different policies. The results show that policies are more effective (i.e. cheaper relative to the increase in fertility) if subsidies are targeted at higher-order children (which prevents subsidizing children that would have been born even without the policy). More importantly, policies that specifically address the burden of childcare borne by mothers are vastly more effective than those that provide subsidies to fathers: the cost of the policy declines by a factor of about three if support is directed at mothers. Our results show that governments could make much progress in addressing the European fertility crisis by designing policies that specifically address the lopsided burden of childcare borne by mothers. However, it is worthwhile to keep in mind that there is also a cultural dimension to the distribution of the burden of childcare. The fact that in many countries men continue to do little childcare work even though women’s labour force participation has risen sharply suggests that cultural expectations and traditional role models also play a role. If more European men could be convinced to be equal partners in raising children, fertility rates should start to recover on their own. Statistisches Bundesamt (2015), “Bevölkerung Deutschlands bis 2060: 12. koordinierte Bevölkerungsvorausberechnung.” Statistisches Bundesamt, Wiesbaden. An early example of this literature is Becker and Barro (1988). Recent studies include Adda, Dustmann and Stevens (2016) and Bick (2016). The role of limited commitment for understanding fertility choices was first emphasised by Rasul (2008).